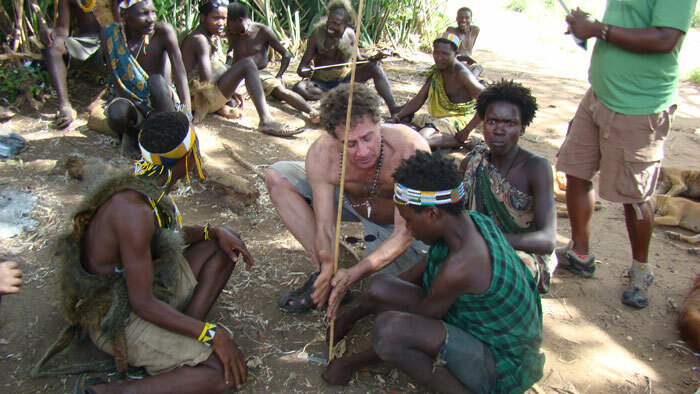 I stumble into the Hadzabe bushmen camp in Tanzanian bush near the Serengeti around 5:30 am. 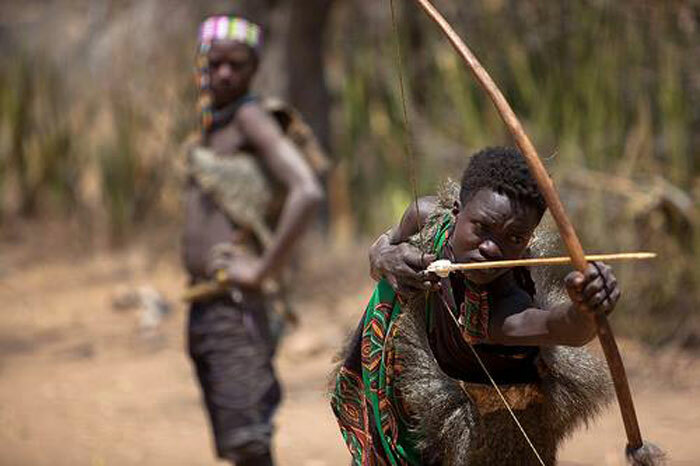 The Hadzabe are one of the last hunter-gatherer tribes on earth. 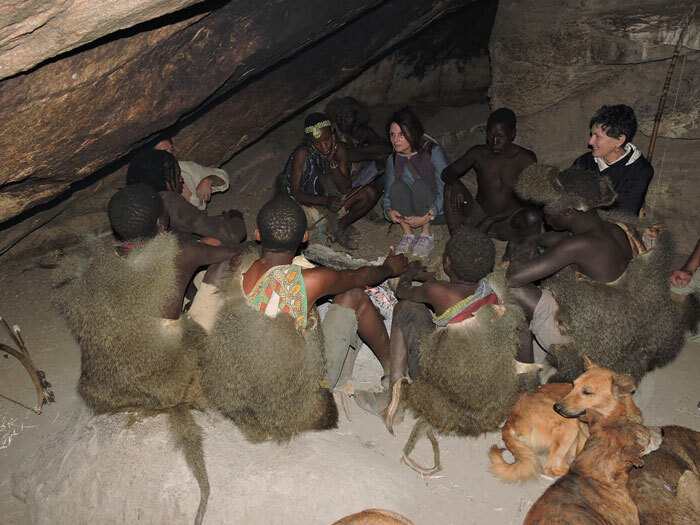 It is pitch black out and I join the bushmen hunters in their communal cave where they are huddled around their campfire flickering in the back of the cave. 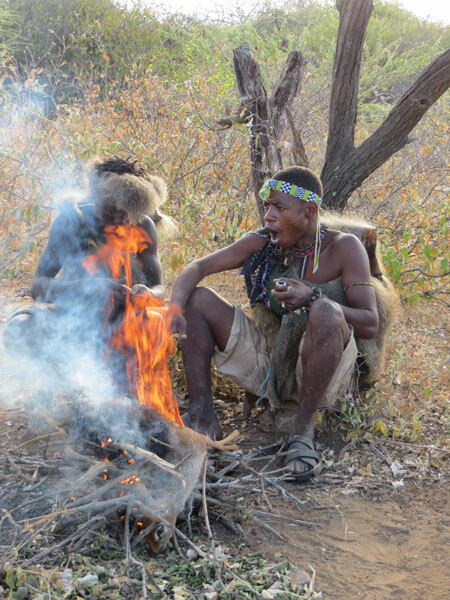 They are wearing their baboon skins that protect them from the acacia thorns when hunting in the bush. A thin muscular man jumps out from nowhere and straddles my body with legs wrapped around me making baboon sounds. I immediately realise it must be No’nn’a, the Hadzabe chief whose clan I have visited multiple times. I then show him the 56 six inch nails I brought with me as a gift and he starts barking out yelps, hoots and baboon-like sounds, as he usually does when he gets excited. 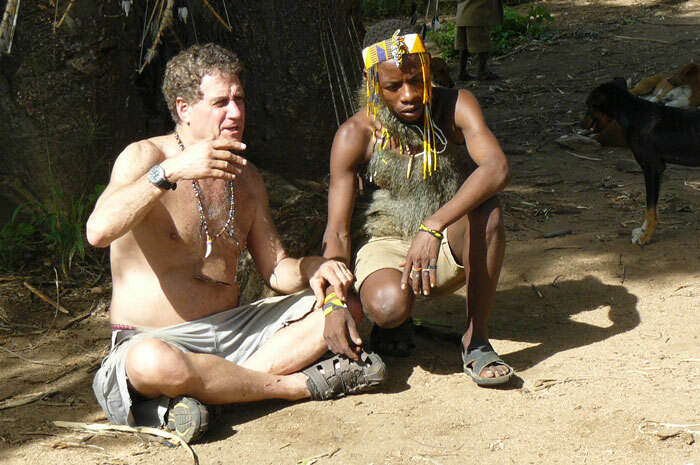 The nails will be melted down by the blacksmith of the neighbouring Datoga tribe and pounded into sharp lethal arrowheads in exchange for Hadzabe meat and honey. The chief looks much older and thinner than the last time I saw him about a year ago. The skin on his face is more wrinkled and has hardened. He is only around 30 years old, but he is now an elder, as a high proportion of Hadzabe die between the ages of 30-40. It is estimated that 800 Hadzabe are still alive, living as they have since the end of the last Ice Age, 10 000 years ago, near the shores of Lake Eyasi. No’nn’a begins bending and sharpening bows and arrows, as he does every day prior to the hunt. I receive my baboon skin and bow and arrow, so I can join the hunt. After a while, outside the cave the sky begins turning a bluish pink and then a bright yellow, illuminating the cave and we leave the cave. 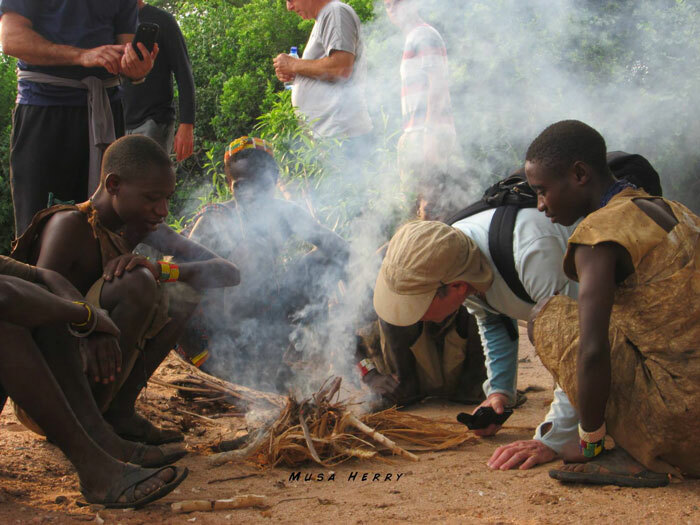 The chief rapidly clicks out orders to his hunters where they should go to distribute themselves in the bush for the morning hunt. I join the chief’s group. As we enter the bush, the chief stops and makes a variety of bird and animals calls and waits quietly to listen. He starts tracking dik dik (a tiny antelope) hoof prints and dung droppings. After a while he hears something and pulls back his quiver with his powerful right arm and the arrow flies. After he let’s go he runs into a clump of bushes and comes out with a dik dik over his shoulder with an arrow piercing its neck. His assistants’ immediately begin to gather wood while others start rubbing sticks together. When the sticks start smoking, a clump of dry grass is put near the smoke, it’s blown on and it suddenly bursts into flames. 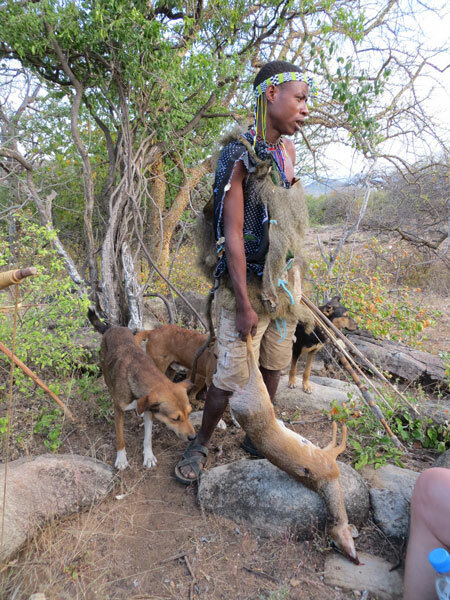 Within ten minutes the hunters are eating parts of the roasted dik dik and bring the rest if it back to the community. 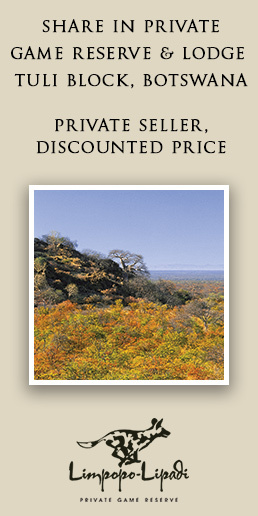 To read more about hunting with the Hadza check out our online magazine.